Date español IV. La cita para hoy. Más vale estar solo que mal acompañado. It's better to be on your own than with people you don't like. 2 La cita para hoy. Más vale estar solo que mal acompañado. It's better to be on your own than with people you don't like. 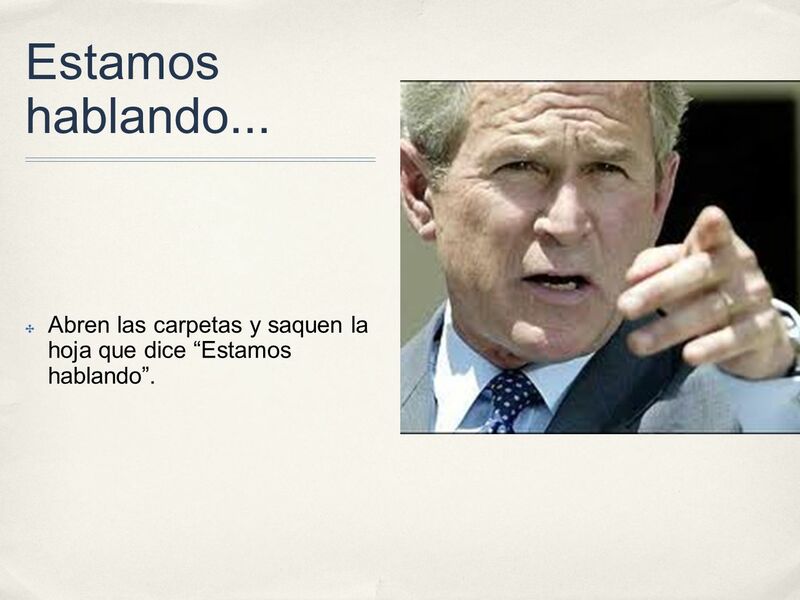 3 Estamos hablando... Abren las carpetas y saquen la hoja que dice Estamos hablando. 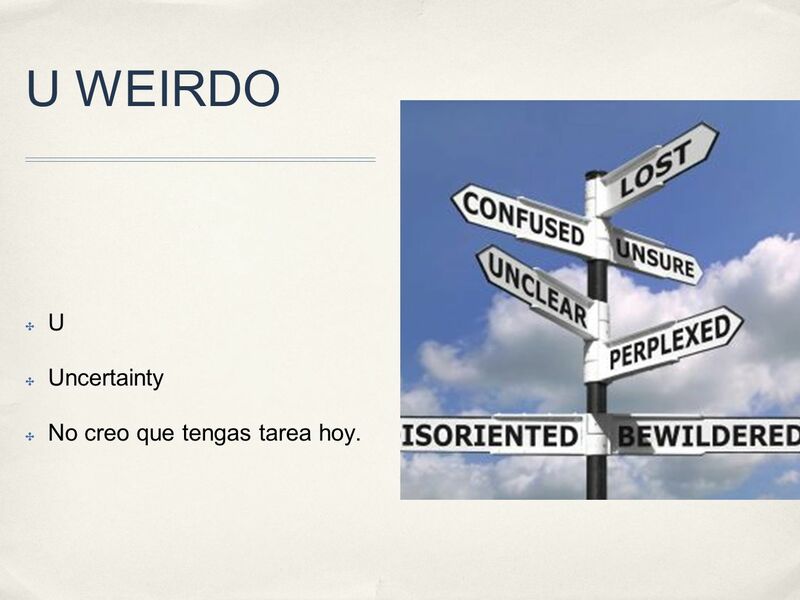 7 U Uncertainty No creo que tengas tarea hoy. 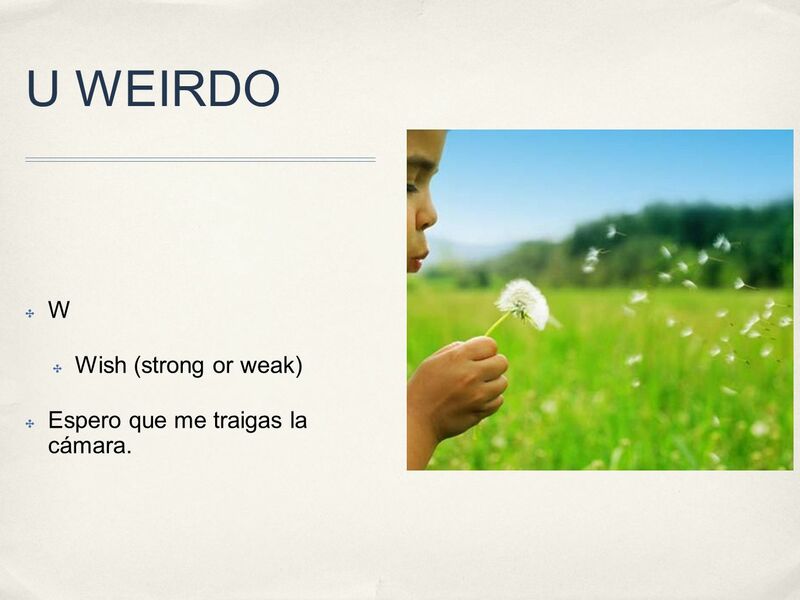 8 U WEIRDO W Wish (strong or weak) Espero que me traigas la cámara. 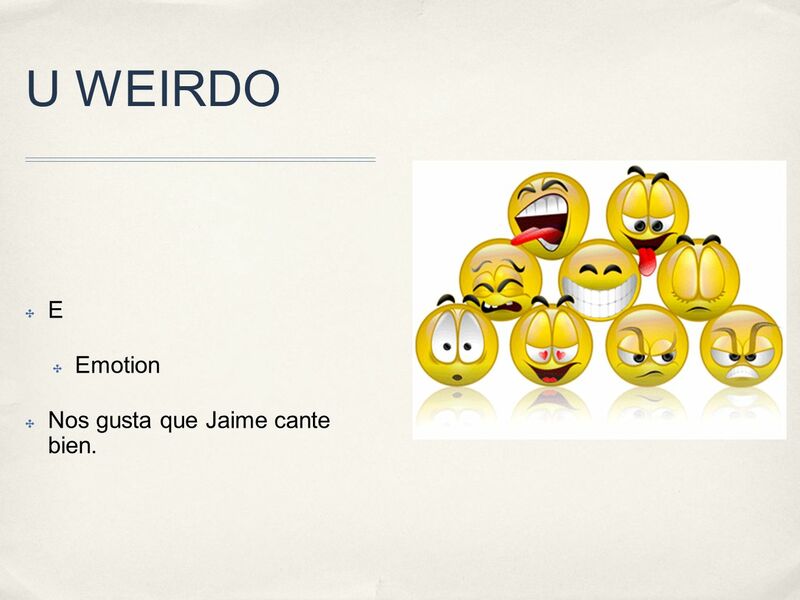 9 U WEIRDO E Emotion Nos gusta que Jaime cante bien. 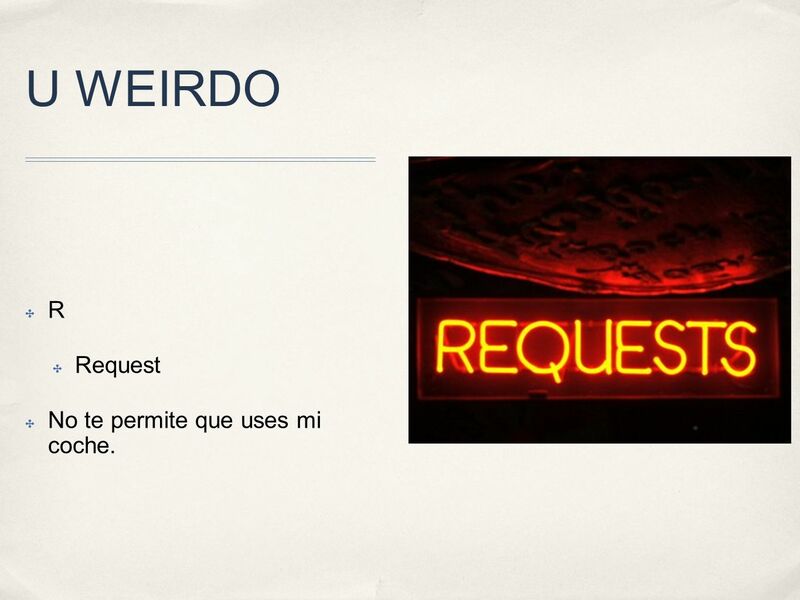 11 U WEIRDO R Request No te permite que uses mi coche. 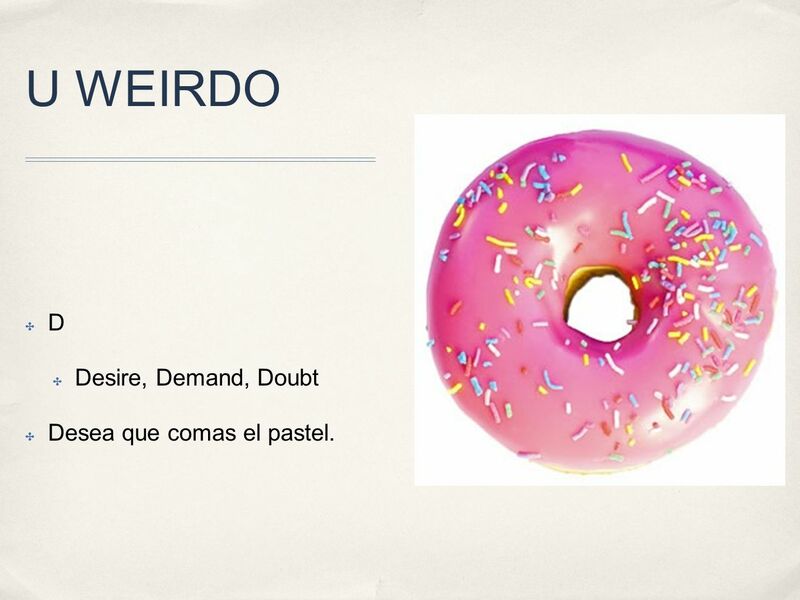 12 U WEIRDO D Desire, Demand, Doubt Desea que comas el pastel. 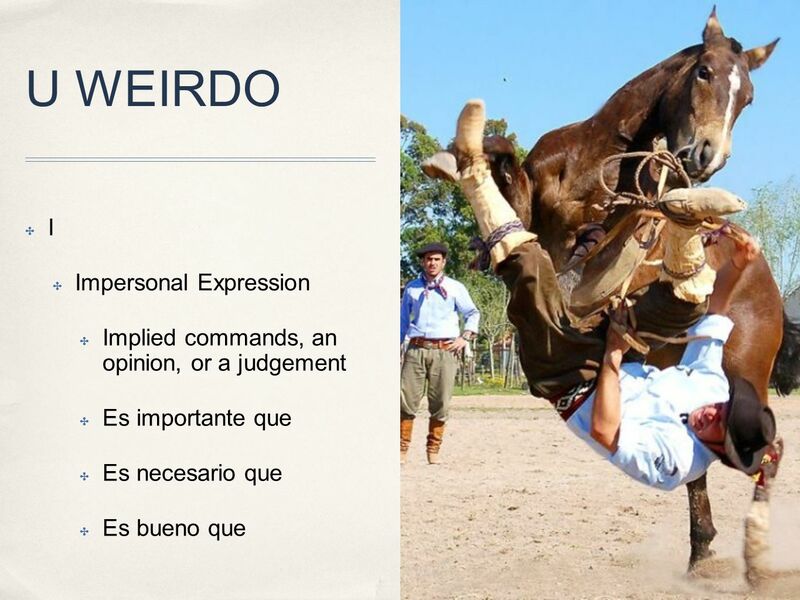 13 U WEIRDO O Ojalá ¿De dónde viene la esperanza? 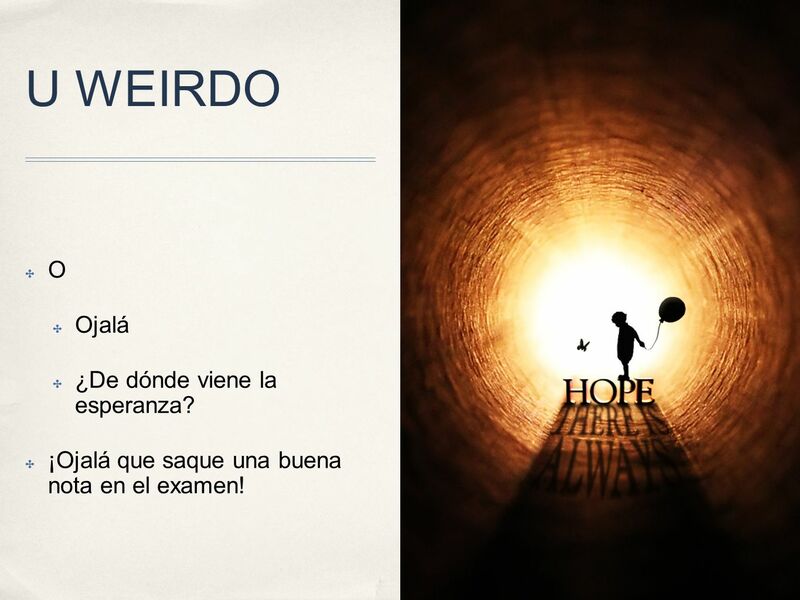 ¡Ojalá que saque una buena nota en el examen! 14 ¡Abren los sobres! Saquen los sobres Cada persona necesita un sobre. Siguen las instrucciones. 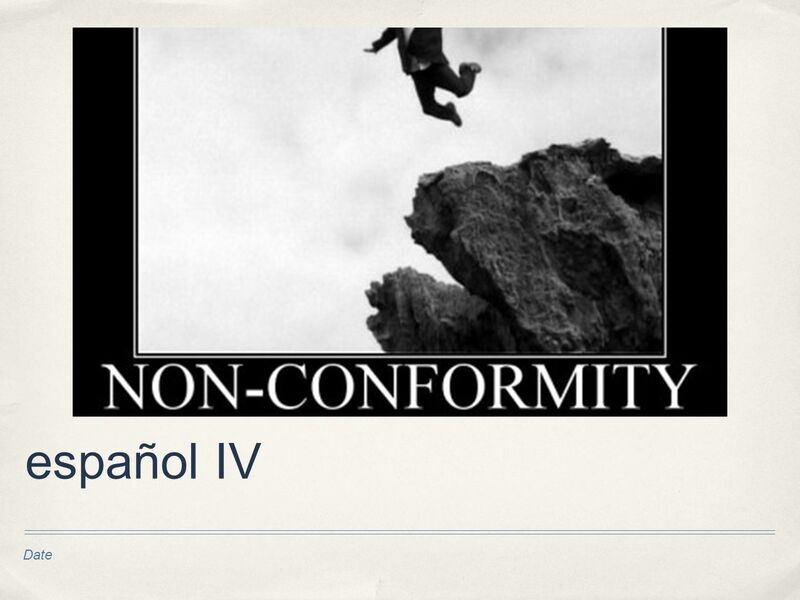 Descargar ppt "Date español IV. La cita para hoy. Más vale estar solo que mal acompañado. It's better to be on your own than with people you don't like." Content Objective I will be able to DISTINGUISH the differences between the INDICATIVE and the SUBJUNCTIVE moods. Language Objective I will be able to. 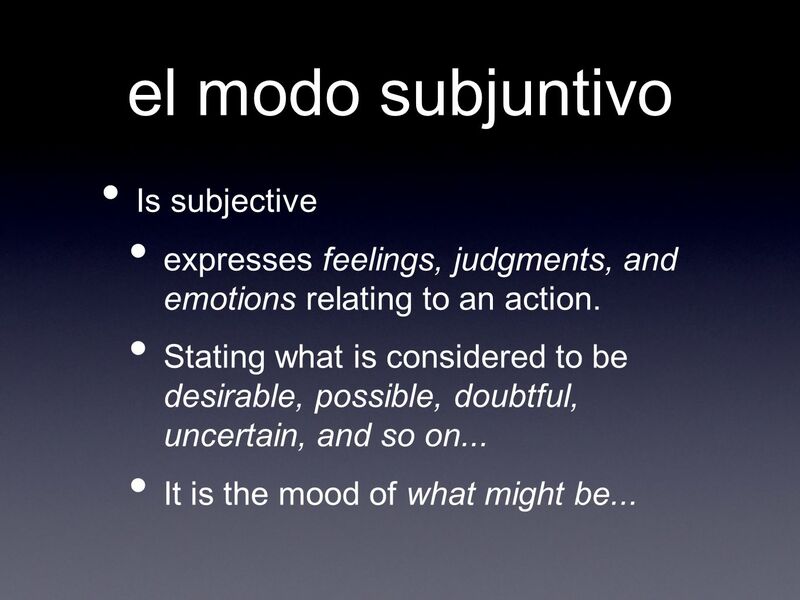 Content Objective I will be able to RECOGNIZE the differences between the INDICATIVE and the SUBJUNCTIVE moods. Language Objective I will be able to DISTINGUISH. 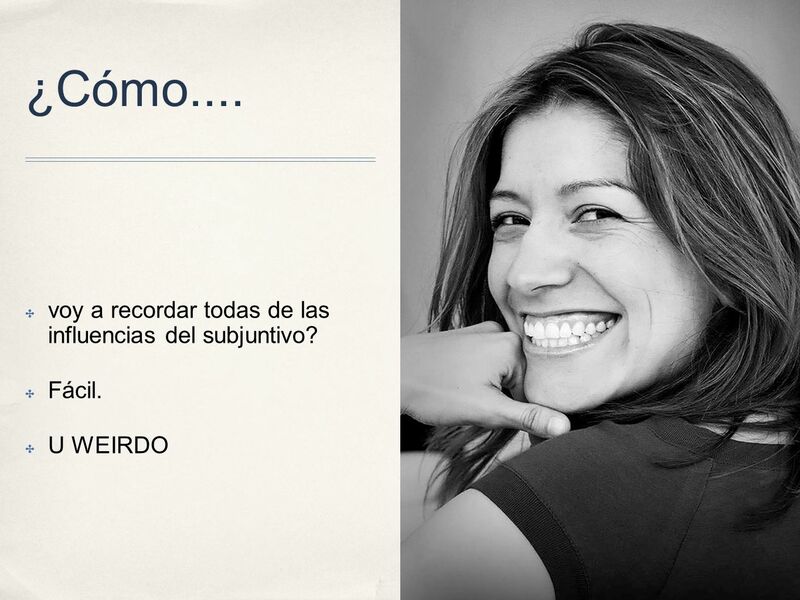 La introducción al subjuntivo el subjuntivo In any sentence, the verb is the word or group of words that identifies the action. Verbs mood tense. Ser o Estar! To be or to be!. Ser is used to express: 1. The hour, day, and date 2. Place of origin 3. Occupation 4. Nationality 5. Religious or political. 1. Es dudoso que Ramón reciba una buena nota en el examen. 2. No es cierto que ellos vayan a Mexico. 3. Es malo que comas mucho helado. 4. Es importante. Content Objective: Students will learn how to express Hopes & Wishes with the Subjunctive Mood. Language Objective: Students will express Hopes & Wishes. Starter- present tense revision 1) yo (tener) 2)yo (empezar) 3) Yo (salir) 4) Yo (hacer) 5) Yo (jugar) 6) Yo (aprobar) o-ue change 7) yo (poder)- to be. 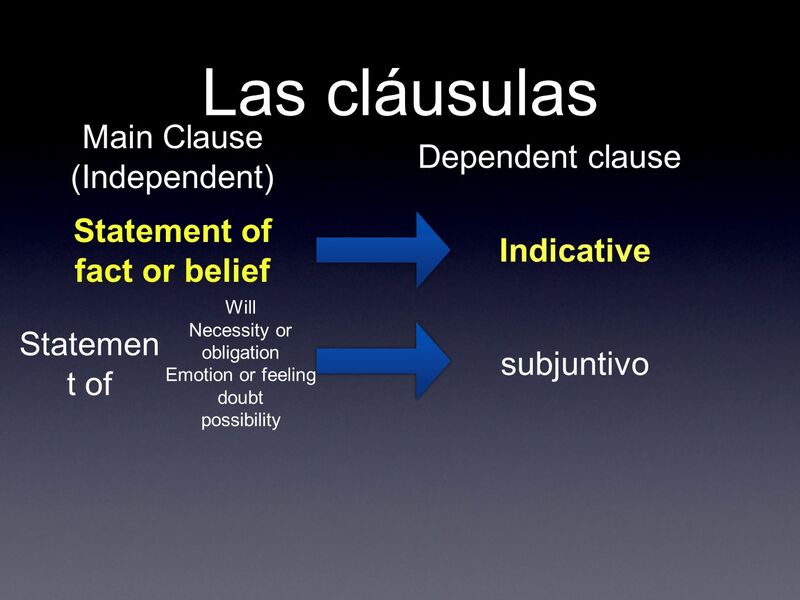 El Subjuntivo y Las Emociones Anytime what is being expressed is an emotion about the actions of someone else, the subjunctive is required.